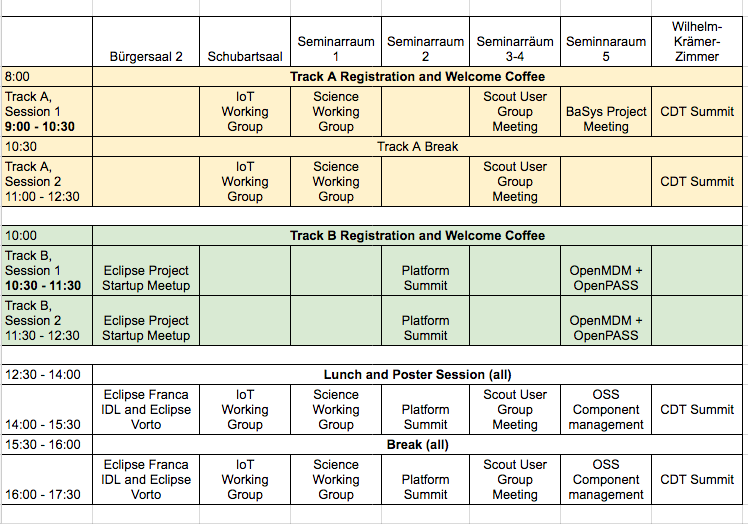 This page is the live agenda for the Eclipse Unconference in Ludwigsburg on October 24, 2016 at the Forum. Please note: You must register (and pay) for the Unconference in order to attend the sessions below. You may add the Unconference registration to your EclipseCon Europe registration, or you may register for the Unconference only. See more on the EclipseCon Europe registration page. The Unconference rooms are almost full so please get in touch with us (gael.blondelle _ at _ eclipse.org and susan.iwai _ at _ eclipse.org) if you need space for your group. Unlike the regular conference, this Unconference is organized by YOU. There will be food and beverages, power and projectors, and meeting rooms. We will coordinate just a bit to avoid obvious topic overlaps during the day and to make sure that everybody has the right place for their group. There will be some spaces dedicated to a Dev co-working space, that is, spaces where developers meet and work together on their preferred projects. Both experienced and new contributors will find that the co-working space is a good chance to meet and learn from each other. Registration: If you plan to participate, you have to register for the Unconference on the conference registration page. During the Unconference, we will host a poster session over our lunch break. Please send an email to gael.blondelle _at_ eclipse.org and susan.iwai _ at _ eclipse.org if you plan to come with a poster so that we make sure we have enough boards for display. The displays are 118 cm wide x 141 cm high. Please list your poster below. BaSys Project: BaSys 4.0 is a new German Industrial Internet project which plans to develop an “operating system” (as a common middleware similar to AUTOSAR) for production plants and industrial applications in general. The Unconference has two tracks. Track 1 starts at 9:00 and has two 90-minute morning sessions. Track 2 starts at 10:30 and has two 60-minute morning sessions. Both tracks follow the same lunch and afternoon schedule. Project Overview: Short (1 slide) reminder about your project functionality. This is for people who are be new. How to get other projects onboard like BioClipse, ...? Are HDF5 bundles in Orbit available already? Is it possible to create an "Eclipse IDE for Scientists" like "Eclipse IDE for Java EE Developers" or "Eclipse for RCP and RAP Developers"? Which steps are necessary to be part of the release train next year? Sharing knowledge about software components and their qualities. Providing a broad overview of the components used. Coping with a growing amount of 3rd party components. See the module count web site for the numbers. As a consequence, the inter-operation between software management and software analysis tools is inevitable. In a growing ecosystem of tools and solutions in this area, common interfaces and data formats are required for comprehensive usage in organizations. A first step towards common interfaces and data formats: getting a common understanding about the challenges and how to cover this topic further. For example, the Eclipse IP team is not the only to face these challenges, and the Eclipse community is now tackling the topic with projects like SW360. Meet the SW360 project leaders and other experts for fruitful exchanges about this topic. Targeted Audience: Everyone is welcome to participate who is interested and/or has ideas how to contribute to this area. This group is created to have discussion around the Eclipse Platform architecture and possible enhancement we could do for the next release. Of course this group is also the place to be for eclipse platform committers, to know us better and to share our ideas. Join this session if you have any idea about this topic, and especially if you are an Eclipse platform committer. Of course, use this issue list to give your feedback and your ideas even if you can not attend. The CDT Summit is a one-day, informal gathering of CDT (Eclipse C++ Development Tooling Project) users and extenders. The goal of the summit is to collaborate and drive the future direction of CDT. The Scout User Group Meeting is the place to learn and exchange about building business applications with the Scout framework. The day offers a chance to hear the latest on updates to the platform, exchange with fellow users or even get yourself started using Scout. Scout users are invited to present their experiences and ideas for using and developing the framework. Find out more! This session is for projects starting up at Eclipse. It is an opportunity to introduce your project to the Eclipse community and help your contributors and committers get the information they need during their launch phase. We will be giving all new projects an opportunity to do a lightening talk during the session. We also encourage you to take advantage of the lunch time poster session. Visit the Eclipse Project Startup Meetup page for more information and registration. We welcome suggestions for topics you as a new project would like to discuss. Email susan.iwai@eclipse.org with your suggestions! Franca and Vorto both offer an interface definition language and code generators for modeling communications interfaces. This session will allow the creators of these two projects to present their tools to each other, with the goal of identifying potential areas of future collaboration. Users of these tools are also welcome to participate and bring a requirements perspective to the discussion. This page was last modified 17:55, 27 October 2016 by Roxanne Joncas. Based on work by Jochen Hiller, Benjamin CABE and Francois Le Fevre and others.